Wheat can present some problems in the brewhouse, but they are all manageable. This is the third part in a series on German wheat beers. The first part was posted September 3rd. German hefe-weizens are made from wheat malt and barley malt. A beer must have at least 50% wheat malt to be called a hefe-weizen and a 70:30 wheat to barley ratio is the classic Munich-style blend. Hefe-weizens are normally 11–13 °Plato (OG 1.044–1.052), with some examples being slightly higher. 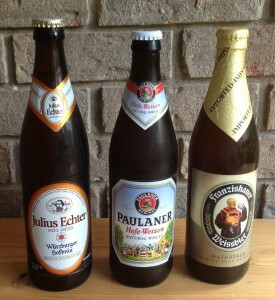 In a wheat beer, the yeast produce a variety of byproducts that give it its unique aroma. One of the molecules is 4-vinyl-guaiacol (4VG), which lends beer a clove-like aroma. In the biochemical pathway leading to 4VG, the immediate precursor is a molecule called ferulic acid. If a mash contains a rest around 109–113 °F (43–45 °C), ferulic acid — which is usually bound to other molecules (pentosans) in the malt, is released in relatively large quantities. This ferulic acid can later give rise (via decarboxylation) to 4VG during fermentation. So, if you add a ferulic acid rest to your mash program, you’ve primed your wort to contain more of the precursor to 4VG. The ferulic acid works best at a mash pH of 5.7–5.8, higher than you would normally want your mash pH to be (5.2–5.6). If you need to acidify your mash to get into the 5.2–5.6 range, you might want to wait and do it after the ferulic acid rest. If you can heat your mash tun, the simplest way to add a ferulic acid rest is to mash in, at your normal liquor-to-grist ratio, at 109–113 °F (43–45 °C) and hold it there for about 10 minutes, then heat the mash to ramp up your saccharification temperature. You can also do this in your kettle, then scoop your mash into your lauter tun. You could also do a step infusion mash in which you rest briefly (15–30 minutes) in what used to be called the protein rest range (around 122 °F/50 °C) before ramping up to saccharification temperature. As I mentioned, if you are an extract brewer, you should perform a partial mash to supplement the wheat malt extract in your recipe. If you’d like, you can add a ferulic acid rest to your partial mash (and I’ll show one way to do that when I post the example recipes). And finally, of course, you can skip the ferulic acid rest altogether. It augments the levels of ferulic acid in your wort, but some ferulic acid would be present simply from taking a wheat beer grist and performing a single infusion mash. The next installment in this series deals with boiling and fermentation. Wheat malt actually contains less ferulic acid than barley. So if you want to increase ferulic acid, consider reducing the amount of wheat in the beer and use more barley.